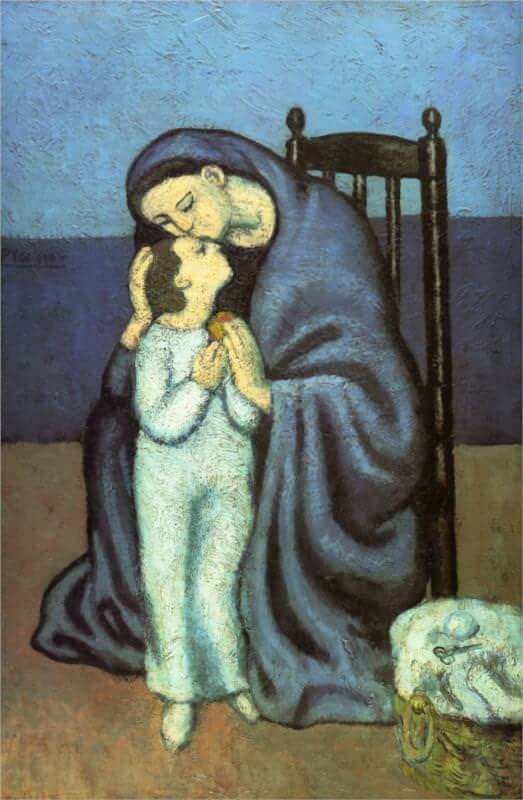 The religious connotations of any picture involving a mother and child are inevitable and this iconic statement is one of a series of'Madonnas' painted during the Blue Period. Picasso repeatedly combines the themes of religion and poverty as his development of the female figure moves away from the sexual allusions encompassed in prostitute images, to the more hallowed portrayal of the mother figure. The almost monochromatic use of blue in this period, and its traditional association with the Madonna, are superbly combined to produce a set of haunting, almost ghostly images. Notably, many of the Blue Period women are bowed as if carrying a heavy emotional burden. Here the handling of space has a distinctive feel. The spatial structure is clearly defined and organized in horizontal bands crossed by the vertical lines of the upright chair. This grid-work of lines is beautifully disturbed by the gentle motion of the mother's lovingly bent head kissing the child. The flowing line is echoed in the cascading folds of the mother's wrap, redeveloped in a similar figure in La Vie (1903).